At least three people were killed and 10 wounded in an attack on Tuesday on the Libyan foreign ministry in Tripoli, according to an updated toll from the health ministry. A civil servant who headed a department in the foreign ministry was among those killed, a security source said. One of the three attackers was killed by the ministry's guards while two others blew themselves up, the source told Reuters news agency. Libya's health ministry stated that at least nine people were wounded in the attack, which is suspected to have been carried out by the Islamic State of Iraq and the Levant (ISIL, also known as ISIS) group, according to a security source, who requested not to be named. Foreign Minister Mohemed al-Taher was not inside the building during the attack as he was accompanying Prime Minister Fayez al-Sarraj during a visit to the western city of Zawiya, according to a source from the ministry. Billows of smoke were seen rising from the ministry building following the attack, for which no group has yet claimed responsibility. Libya's security forces cordoned off the area and took control of all the buildings around the foreign ministry headquarters, Abdelwahid said. All individuals and employees have been ordered to evacuate the buildings immediately, he said. "The situation has relatively calmed down after security forces took control of the building. 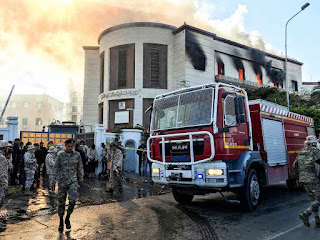 According to reports from the foreign ministry, the foreign attackers stormed into the building, started shooting, heavy gunfire was heard and the special deterrence forces took control of the situation," Abdelwahid said. Libya has been torn apart by power struggles and undermined by chronic insecurity since the killing of Muammar Gaddafi in 2011. Suicide bombers have targeted a number of vital institutions as armed groups take advantage of the chaotic political situation.